On 7th day of Navratri, Maa Kaalratri, who is the seventh manifestation of Maa Durga is worshiped. With dark black complexion, bountiful hair Ma Kaalratri is shown riding on a donkey and is depicted with four hands. Ma’s right hands are in Abhaya and Varada Mudra and in her two left hands she carries a sword and a deadly iron hook. One of the most ferocious forms of Goddess Parvati, Ma Kaalratri blesses her devotees with courage and resoluteness for achieving their goals. Her blessing is known to remove all hurdles, difficulties and fears from the lives of her devotees. 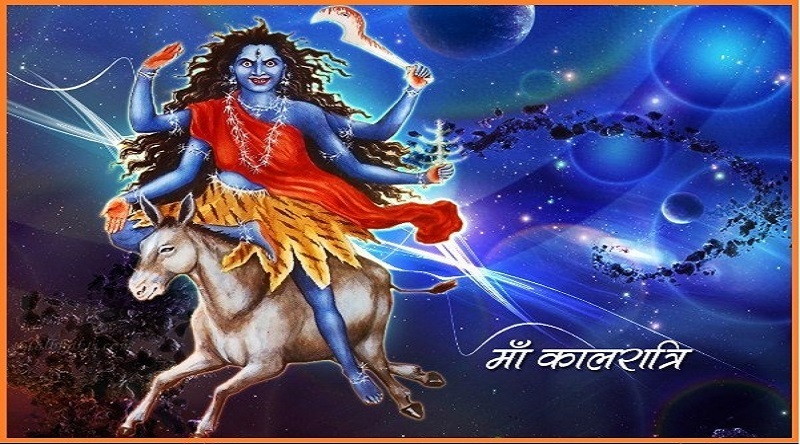 Also known as Goddess Shubhankari (शुभंकरी) because of this auspicious power within her ferocious form Goddess Kalaratri is also the favourite of Tantriks for various dark practices. After the seventh day Poojan, Ma Ambike is propitiated as Mahagauri on the 8th day and Ma Siddhidatri on the 9th day of Navratri. ← Why is Navaratri celebrated? 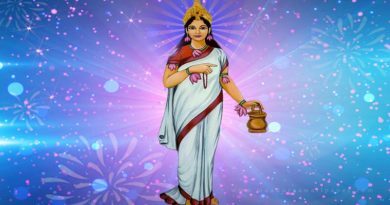 What is the importance of Poornima in Hinduism?